The VentElite was designed for animal research applications and is intended for use on subjects ranging in size from mice to guinea pigs. The goal in designing this ventilator was to maintain versatility and ease of use while fostering safe and physiologically accurate mechanical ventilation conditions. 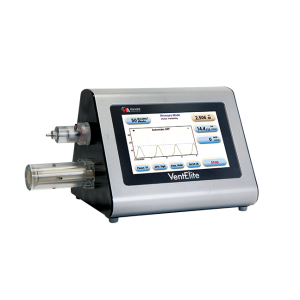 The VentElite utilizes advanced piston/cylinder and valve assemblies, combined with microprocessor controlled actuation mechanisms to precisely control respiration profiles. The VentElite has two operating modes, Volume Control and Pressure Control, and allows users to easily toggle between these two modes via the button on the large touch screen. The Volume Control mode delivers the desired tidal volume to the subject by precisely controlling the stroke of the piston. The Pressure Control mode of the VentElite allows the user to set the peak inspiratory pressure (PIP) value, and adjusts the tidal volume as necessary to maintain the set PIP. Features of the VentElite include manual or programmable Sigh, Inspiratory or Expiratory Hold, adjustable I:E, built in PEEP, audible alarms, and a real-time graphical representation of the detected pressure.